This one has it all! Exquisite four bedroom home with a first floor master, it has many desirable features to enhance your family life. 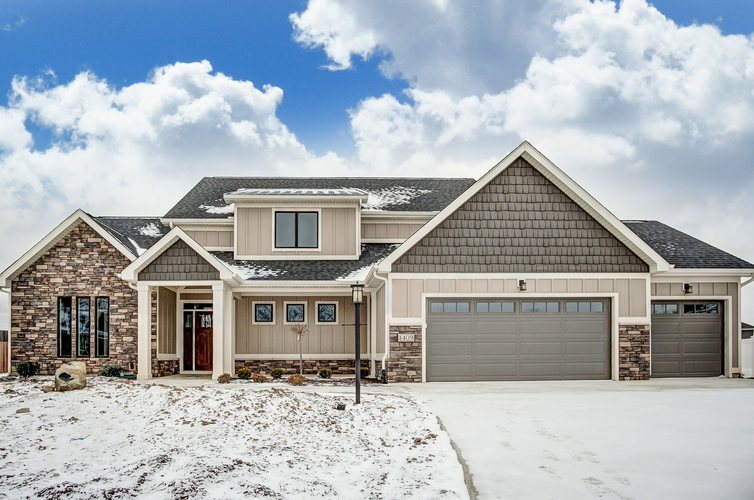 Built with expert care by Art Bunt Homes, it is located in the Northwest Allen County school system, on a cul-de-sac lot in Talons Reach addition. The first floor is an open concept from the great room, dining room and to the kitchen, with plenty of natural daylight. The kitchen boasts custom crafted cabinets by Schmucker Woodworking in soft white and grey, a full LG kitchen appliance package in stainless steel, quartz counter-tops and an 8' island, perfect for entertaining. An extension of the living area is out of doors, under the 20' X 10' veranda which has a view of the large, private backyard. The master bedroom suite has a ceramic shower, two bowl vanity with hard surface, and an amazing 12' high closet, perfect for storing off season clothing. Upstairs you will find 3 additional bedrooms with plenty of storage, a separated bathroom with an over-sized linen closet and a finished 17' X 18' bonus room. EXTRA FEATURES INCLUDE: Closet Concepts throughout the house, lockers; finished storage; crown molding at the top of the windows; shiplap wall; car siding; wainscot paneling and a partially floored attic area. The HVAC system is a high efficiency, two-zone system for controlled comfort. Come see for yourself!